(Bloomberg Opinion) -- As activists dubbing themselves the Extinction Rebellion undertake a two-week campaign to disrupt London by blocking traffic, climate change is becoming more broadly accepted as the biggest single challenge the world faces – and not before time. Investors are under increasing pressure to use their financial clout to do more to help the environment. And they’re being financially motivated to meet the challenge. Next month, the Netherlands is poised to become the first AAA rated government to issue green bonds, debt specifically sold to finance environmentally friendly projects. On May 21, the Dutch government plans to sell as much as 6 billion euros ($6.8 billion) of 20-year green securities; in the coming years, it will boost the size of the issue to about 10 billion euros to ensure liquidity. Given the asset management industry’s current fervor for anything and everything sanctified to satisfy its appetite for socially responsible investments, demand should be strong. So the Dutch government has added an extra hurdle to the auction process. To qualify for “priority allocation,” investment firms have to testify to their “sustainability credentials” in advance of the bond sale by pledging to meet criteria such as having a dedicated ESG team analyzing its investments or running a fixed-income fund specifically focused on green debt. 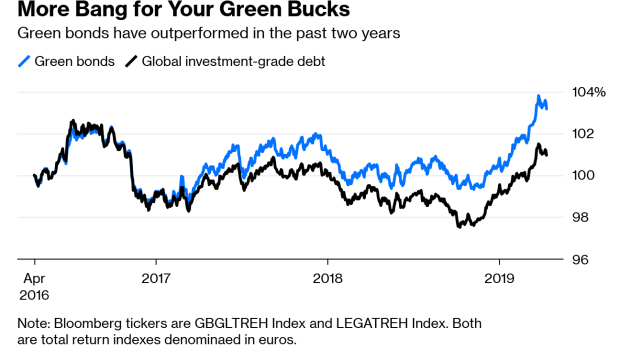 Given how returns on green bonds have outpaced those available in other areas of the fixed-income universe in recent years, it’s probably worthwhile taking the trouble to qualify under the Dutch rules. France, home of the Paris Agreement on climate change signed by 195 countries in December 2015, has been at the forefront of the push to make green bonds a bigger part of investors’ portfolios. Its 7 billion-euro inaugural issue, repayable in 2039, has been increased several times since its launch in January 2017 and now has a size of 16.5 billion euros. Green bond sales climbed 18 percent last year to reach $135 billion. The pace of issuance increased in the first three months of this year, and with an additional $8 billion sold this month alone, 2019 is poised for a record. And while European asset managers have been at the forefront of the drive to assimilate ESG measures into their portfolios, investors in other regions are coming under similar pressure from their customers. Last year, Pittsburgh’s Federated Investors Inc. paid about $350 million for a 60 percent stake in Hermes Fund Managers, the London-based asset manager that started life managing the pension plan of U.K. telecom company BT Group Plc. In a conference call last month, FI’s Chief Executive Officer, J. Christopher Donahue, described Hermes’s long-established ESG capabilities as a “secret sauce” that it’s starting to integrate into its U.S. business, which oversees about $460 billion. For evidence of the finance industry’s growing obsession with environmental, social and governance principles, check out this chart of searches generated by Google Trends, as noted by analysts at UBS AG in a research note last week. The ESG bandwagon is starting to accelerate. If ignoring ESG issues starts to hurt investment firms already suffering from increased regulation and downward fee pressure, they’ll redouble their efforts to become more socially responsible. Fear of missing out – on the savings of environmentally conscientious millenials or on AAA rated green bonds – is a powerful motivator. Mark Gilbert is a Bloomberg Opinion columnist covering asset management. He previously was the London bureau chief for Bloomberg News. He is also the author of "Complicit: How Greed and Collusion Made the Credit Crisis Unstoppable."